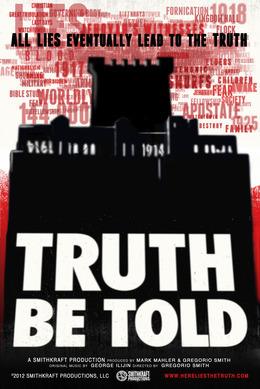 TRUTH BE TOLD lifts the veil on the seemingly benign Jehovah’s Witnesses religion to expose a profit-driven, isolationist culture characterized by fear, totalitarian corporate leadership, intellectual & spiritual intimidation, suspension of critical thinking, failed prophecies, doctrinal inconsistency and improper handling of physical and sexual abuse allegations within the church. See former Jehovah’s Witnesses candidly discuss growing up inside the religion. They reveal experiences including the effects of proselytizing door-to-door, shunning non-observant family and friends, suffering the discouragement of pursuing dreams like gaining a higher education, missing other societal holidays and customs. Q&A- Stick around after the film for a Q&A with the director! Only 15 days until presale deadline. As a reminder, a minimum number of seats must be reserved by 3/6/14. HELP US MAKE IT HAPPEN TEXAS! to watch it . I hope this new film will likewise be used by God to open the eyes of many. Witnesses of Jehovah clearly had a Christian slant. I don’t know if this one does. I still want to see it though.